After over 20 years of creating artwork files for print, I must have supplied thousands of business cards proofs. Using this experience, here are my top ten tips on what to include on a business card. If you’re lucky enough to have credentials to display after your name, ensure they are not the same size as your name – this can look overbearing and confusing. Depending on the type of industry you’re in, you may want to consider displaying your nickname too. This will show your company’s personality and could create a valuable talking point at networking events. Again, this depends on your audience and customers. I know an accountancy firm that calls themselves ‘Bean Counters’ which I think is cool. But, would a serious client with no sense of humour appreciate that? Think of your business card as the door to your company so display your logo somewhere prominent. People’s focus usually starts in the top left of a screen or document so that’s where your logo could be. If your logo doesn’t explain what your company does, then ensure you make it clear somewhere on your business card – don’t leave your reader guessing. Spell it out for people. Firstly, ALWAYS include your website address, because if all else fails, people can visit your site for more information. Decide how you’d like new contacts to get in touch. If you prefer people to call your mobile, rather than your main landline, then just put your mobile number. If people want your landline, they can always find it on your website (make sure they can do this easily). If you want to put your landline somewhere, then make your mobile number bigger and bolder. If there is space, include your email address. If your email is long because of your name or domain name or both, then display it small. By ensuring your website is displayed somewhere if people struggle to read your email, they can refer to your website address, which should have the same domain name. If they’re not the same – why not? Avoid using “joebloggs@hotmail.co.uk” with “www.joebloggsislovely.com“. This looks unprofessional. Ask yourself (or the company that hosts your email) why don’t I have, “joe@joebloggsislovely.com“? More and more so, we are receiving business card files that have no physical address on them, which makes sense if people work from home and don’t want people turning up to their house while they’re having breakfast in their Superwoman Pyjamas. But if you’re trying to create a perception that your company is more established, including a location at least would be useful. Fax? What is a fax? Be honest, when did you last hear the fax machine ring? Of course, if you’re a solicitor, you may need to include it but if you can, then leave this off. Do you use Social Media for your business? If yes, then include the identities of social media platforms on your business cards. Use the ones you use regularly or receive the most engagement from your audience. There’s no point including platforms like ‘Pinterest’ or ‘Google+’ if you have no intention of using them. Social media icons and identities can take up a lot of room. Your business cards are ‘prime advertising space’ – so use the space wisely. Here at Essential Print Services, we evaluated the return on investment from our social media activities and found that we had the least amount of engagement with our audience on Google+. So when I was designing our new business cards, and I had no space for a fifth social media identity, I knew which one I could afford to leave off. I would advise you to include which account you want people to follow or ‘like’. Don’t leave it to chance. If you have a personal and business account, ensure people know to ‘follow’ your business account. Do you want a business prospect following your personal account and seeing what you did at the weekend? How to display your social media identities on your business card. Avoid using the whole URL (i.e. www.facebook.com/essentialprint); this will take up too much space. For LinkedIn, use the icon and ‘Your Name’ or ‘YourName’. People will search for you anyway. If you print the icons, don’t manipulate them. They are someone else’s property. I know I wouldn’t appreciate it if someone changed my logo without permission. Ensure these identities AKA ‘handles’ ARE correct and the ones you’ve registered – don’t guess them. They could belong to someone else (heaven forbid). Check that they all work and go to the right business account before going to print. CHECK EVERYTHING BEFORE APPROVING YOUR PROOF. Only if you have space; include a handful of bullet points about how you can benefit customers. A short sentence should do the trick. Depending on the type of font you’re using, try not to use fonts no smaller than 7pt. I have seen text so small on a printed business card that I have struggled to read it. On the flip side; I have received cards where the name of the person is HUGE, but the details are tiny. Ensure your font size depicts the hierarchy of its information but no so much so that it looks disproportionate. You can download a FREE business card template here. Buying more cards than you need is a false economy. You deny yourself the opportunity to refresh your business cards and update information. If you buy thousands, you run the risk of becoming bored and disenfranchised with the content; this may even discourage you from giving them out. A new finish or trend of cards may arrive, and then you’re left with hundreds or thousands of cards made redundant because you want to keep up with the times. If you’re a start-up company purchasing your very first set of business cards, you may want to keep volumes low because of the price. I’d recommend buying 500 business cards for your first set. You’ll be amazed at how many you’ll get through. Supportive family and friends will want a few each, and before you know it, you’re placing a re-order and paying twice. Whenever you want to change the look or material of your business cards – always ask to see a sample of the card. We have sample packs ready to send – request one here. Once you’ve had your new cards printed, be sure to obtain honest feedback from people. You may think your new business cards are the bee’s knees but does your message come across correctly? You’ve set out what your card will look like; you’ve worked out how many you’ll need, now think about what type of card you’d like. Our most popular is 350gsm-400gsm weight with a matt laminated coating both sides, which makes the card durable and helps against them becoming dog-eared in handbags and pockets. A soft touch laminate is also available at the same price. We also offer super-thick business cards: 600gsm! A chunky, quality business card that packs a punch, available with an uncoated finish or matt laminated finish. Coloured core centre, available in a variety of colours. FINISHES: There are more choices than ever before but Spot UV remains the most popular. Spot UV is a shiny bit of film applied to particular areas of graphics and images. UV works well when applied to a dark background. On light backgrounds or thin text, it is not very noticeable and we wouldn’t advise it. The price of Spot UV business cards has reduced dramatically in recent years so, ask us for a price. Pictured here, you can see how the Spot UV applied directly on the black background really stands out. Here at Essential Print Services HQ, we LOVE round corners. Probably a bit too much. We can offer to round off the corners of your business cards for as little as £10 extra +VAT (for 500 cards). We can round-corner all the corners, just one, two or three! Or have a mixture. 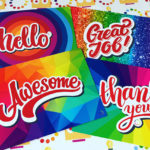 For more information about round cornered business cards, read our popular blog post, “Give your full colour printing the edge”. If you’d like to see samples of any of the above materials or would like a price list, simply call the Print Angels on 01332 418377 for a FREE sample pack. Choose double-sided, every time. It will give you the space you need to make the maximum impact and get your message across. Use surplus space to portray your corporate identity. Make it count. Choose quality business cards from a quality printer and Essential Print Services can certainly help you with this. We will help you decide what will be best for your image and budget. Think about how you will hand out your cards. Will you hand it over considerately and take time over the exchange? Or throw them out like confetti? Every aspect of this first encounter is crucial and will say a lot about you, and your business. Invest in a decent business card holder. Giving out business cards that have been in your pocket for a while, that may be damaged and have bits of suspicious fluff on it isn’t good enough. Look after your cards so that each one looks like it’s hot off the press. You must be proud to hand out any printed literature, especially your business cards so buy cards that you can hand out without hesitation. They could be the best investment you make.